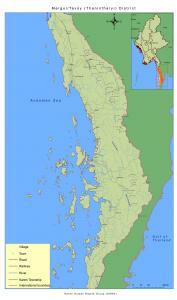 Locally-defined Mergui-Tavoy District corresponds to Tanintharyi Region andcomprises Burma's southernmost territory. It occupies a fairly narrow strip of land 400-miles (644 km) long and never more than 60 miles (97 km) wide along the western portion of the Thai-Malay peninsula. Mergui-Tavoy is bordered by Mon State to the north and the Andaman Sea to the west, sharing along mountainous border with Thailand to the east. Mergui-Tavoy is bisected by the Mawlamyine–Dawei railway line and by the Tenasserim River, which drains at Dawei. The region includes Lenya and Tanintharyi national parks. Background The earliest KHRG reports from Mergui-Tavoy deal with mass forced labour during the construction of a 110-mile railway between Ye and Tavoy towns. The lack of a strong military presence and undeveloped transport infrastructure largely prevented the Tatmadaw from establishing and exercising authority at that time. Travel in the region was difficult;the main road was often little more than a wide dirt track and peripheral roads were essentiallyoxcart tracks. In the hills travel was accomplished by foot, or by canoes along major rivers such as the Tenasserim, where dangerous rapids make travel treacherous. Mergui-Tavoy has become synonymous with large-scale development and resource extraction projects, which have caused extensive forced relocation. Previous KHRG reports have documented extensive abuses related to gas extraction projects in the northeast of Tanintharyi Region; forced relocation in the central-western area around Palauk-Palaw, Mergui and Tenasserim towns; and the widespread use of forced labour in the central part of the region. More recently, human rights conditions in the area have received international attention due to the development of a large deep-sea port project and highway construction in Tavoy. 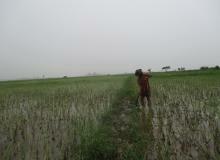 The Tatmadaw was active in targeting villagers in Tavoy Township prior to these large projects. In 1993, KHRG reported on instances of torture and murders that occurred in Tatmadaw-controlled villages. At that time, the Tatamadaw was working to establish control with a local campaign against the KNLA (Karen National Liberation Army). The following year, reports on the construction of large Tatmadaw camps and calls for forced labor were made, attendant with oppressive taxes on villagers who were forced to work .In September 1996, the Tatmadaw began a campaign of forcibly relocating thousands of villagers to government-controlled relocation sites.This campaign coincided with forced labour projects to build roads from Palauk, South to Tenasserim town, while concurrently undertaking an offensive against KNLA positions in both Tenasserim Division and Dooplaya District. The destruction of several Karen villages was accompanied by forced relocation orders and attempts to force the villagers into road labour camps. By the end of January 1997, over 60 Karen villages between the Andaman Sea coast and the Tenasserim River had been destroyed, with their inhabitants forced to move to Tatmadaw-controlled sites or build new roads into their villages. Army camps were then established in the newly accessible areas and supplied along these roads.. Despite this exercise of authority, many villagers in upland areas continued to evade relocation orders. In February 1997, the Tatmadaw used its newly developed transport infrastructure to launch a massive military offensive into KNU strongholds along the upper Tenasserim and Paw Kloh rivers, including the KNLA 12th Battalion headquarters at Kaw Tha Say, near the southernmost tip of Burma. The KNUultimatelygave up most of its territory and the KNLA took up guerrilla operations, while tens of thousands of villagers either fled into Thailand or deeper into hiding in the nearby hills. Bulldozers followed behind advancing Tatmadaw troops to immediately begin work on a road from the port at Tavoy to the Thai border at Bong Ti. This process fueled speculationthat the major purpose of the offensive was to begin work on a joint Burmese-Thai commercial project, which was to link Bangkok to a new deep-water port on the Andaman Sea at Tavoy. No large-scale military operations were reported in Mergui-Tavoy District between 1998 and 2001, although the KNLA continued to conduct attacks on Tatmadaw columns, and outposts and both Tatmadaw and KNLA forces used landmines in a bid to control territory. By 2001, 36 Tatmadaw battalions were stationed in Mergui-Tavoy District and units from other areas of Burma were sometimes redeployed for specific operations. The DKBA and other Karen splinter groups were generally not present in the district. The New Mon State Party (NMSP) maintained a ceasefire area in the northern part of Mergui-Tavoy between 1995 and 2001. The ceasefire was tenuous, mainly because the Tatmadaw repeatedly broke conditions that were part of the agreement, such as territorial guarantees, the cessation of using Mon villagers as forced labourers and the right to teach the Mon language in schools. The NMSP had very little success in pressing the Tatmadaw to honour these commitments because complaints were met with threats abandon the ceasefire and annihilate both the NMSP and Mon villages. The resulting dissatisfaction with the ceasefire resulted in various small groups splintering off from the NMSP and returning to armed struggle. As of December 2001, KHRG reported that much of the area south and east of the Tenasserim River remained a no-man’s land. The Tatmadaw generally has not had a great deal of success in consolidating its control over the area since the 1997 offensive because of inadequate infrastructure to support a large military presence and the continued activities of resistance groups. Internally displaced villagers remain scattered throughout the region, and Tatmadaw forces have regularly dealt with landmines and ambushes by guerrilla forces. By July 2009, Tenasserim Divisional police officers were stationed in all village tracts, followed by the establishment of an additional five military bases along the Thai-Burma border in eastern Te NawTh’Ri Township from south to north, at Moo Ko Paw, Maw Taung, Tone Daw, LerKer and Thath Poe Meh, serving as permanent bases for battalions that rotate every three months to patrol areas of unconsolidated military control. The development of a network of new military access roads served these bases. During 2010, KHRG received reports of land confiscation, facilitated by Tatmadaw-backed coercion, to support business and development projects. As of the end of 2010, community members continued to describe Tatmadaw control in southern areas of Mergui-Tavoyas incomplete, with at least three village tracts remaining mixed-control areas and containing government relocation sites, displaced populations evading Tatmadaw control at hiding sites, as well as villages that, although subject to nominal Tatmadaw control, continued to resist relocation. In the run-up to the November 2010 election, candidates levied arbitrary taxes to support their campaigns or to secure political support for the development of local educational infrastructure. As of January 2011, the extended territory to the south and east of Tenasserimtown, locally known as Te NawTh’Ri Township, continued to include populations of displaced villagers, some of whom were subject to Tatmadaw attacks, including the firing of mortars and the planting of mines in their village after displacement. On January 27, 2011, Tatmadaw Infantry Battalions (IBs) #224 and 349, as well as an unidentified third battalion, fired mortars into a hidden IDP camp in Te NawTh'Ri Township.Thirty households fled from the village, which was subsequently burned down by the Tatmadaw, an act that prompted retaliation from the KNLA. The Tatmadaw remained near the village for one month as the villagers continued to hide. Landmines were planted before the Tatmadaw left as a result of casualties incurred from the fighting. According to a KHRG researcher, a Yuzana Company dam project in an area of unconsolidated Tatmadaw control, at Blaw Seh on the Te Keh River, was reportedly recommenced on August 14th 2010, after being discontinued in 2004. Shortly thereafter, the E--- village head was forced to guide and accompany a group of 50 Tatmadaw soldiers from Light Infantry Battalions (LIBs) #558 and #581, based at Aung Kain in the Te Keh area and under the control of 2nd Lieutenant Than Htun. The soldiers were serving as a security force for three engineers from the Yuzana Company, and the purpose of the trip was to visit and inspect a potential site for the proposed dam. During the journey, a Tatmadaw soldier was severely injured when he stepped on a landmine, highlighting the grave danger to which the E--- village head had been exposed to during his forced service as a guide for the Tatmadaw units. KHRG's community activist in the area also reported that, following the completion of their preliminary analysis of the site, the Yuzana engineers took one viss (1.6 kg. / 3.6 lb.) of earth away for further analysis. Before the group departed the site, the soldiers from LIBs #558 and #581 took inventory of the E--- village population and specifically recorded which villagers possessed motorboats and motorbikes. The villagers said they were told this information was being gathered in order to prepare for the November 2010 elections. However, inventory of village populations has been previously used by Tatmadaw personnel to fix labour demands according to the village's population of able workers, while surveys of land and villagers' possessions has preceded such items' confiscation or use in support of Tatmadaw militarization and development initiatives. Elsewhere in eastern Burma human rights abuses, including the loss of land due to flooding, land confiscation and forced labour, have been documented to attend dam development projects and the subsequent increased militarization of dam development sites. Land confiscation and displacement continued until at least 2011, when KHRG last reported on the activity in Tenasserim District. A KHRG community activist received information from a KNU leader in the Pewa area that a USDP representative, U Than Htay from Pee [Kyunsu] Township, started confiscating 250 acres of land from Gk---village on January 4th 2011. He reportedly planted rubber trees on the 200 acres of land he confiscated as part of a business endeavour for the military government. In Tanintharyi Township, the Tatmadaw has been involved in extorting taxes and confiscating property from local community members. The Pyi Pyoe Htun Company has forced local community members to sell coastal lands for the development of a fishery.